Handmade with Love by Sarah: 3 or More Stamps! The Shining the Light Challenge at Our Daily Bread Designs was to use 3 or more stamps on the front of your card. I decided to use the ODBD set "With Heartfelt Sympathy" as I thought the individual stamps would work well together on my center panel. The sentiment looks a little blurry in the picture because the camera was fighting to focus on the sentiment or the sparkly dragonfly. I lightly sponged over the entire panel with pale blue ink. The three stamps I used were the dragonfly (cut out and popped up on foam dots), the cattails, and the sentiment. 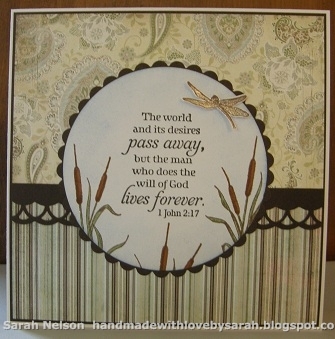 Stamps: ODBD "With Heartfelt Sympathy"
Papers: white, dark brown, dps from Basic Grey "Capella"
this is just so pretty! love the little cattails peeking around the edges... thanks for playing along with the shining the light challenge this week! Oh how beautiful Sara!! Love the cat tails with the sentiment, the soft colors and your design. Thanks for joining the ODBD Shining the Light challenge this week!! Just beautiful. Your papers, colors and that stamp set are so pretty together. Beautiful stamping and like the popping of the dragonfly, pretty punched border!